Dire ecological news and the failures of the global economy are fuelling interest in a “new economics” grounded in principles of ecological sustainability, the democratization of wealth, community empowerment and social and digital connection. Following the success of last year’s first annual Boston College Summer Institute in New Economics, we will be holding another session from August 12-18, 2013. If you are a PhD student in the social sciences, you are invited to apply. We will bring together a group of distinguished faculty who are pursuing research and practice in this emerging field. Confirmed faculty include Juliet Schor (Boston College), Gar Alperovitz (University of Maryland), Joel Rogers (University of Wisconsin), Gill Seyfang (University of East Anglia) and Michel Bauwens (P2P Foundation and University of Amsterdam). Practitioners working on new economy projects will join us for workshops. Together with a dynamic group of students, we will meet for an intensive program of classes, workshops and participatory sessions. Graduate students attending the Institute can expect to leave with a solid grounding in the latest research and theory, and as part of a network of faculty and other graduate students. This year’s institute will be held at the Johnson Foundation’s historic Wingspread retreat center, a Frank Lloyd Wright designed home at Wind Point, Wisconsin. Wingspread is an exceptional facility at the shores of Lake Michigan that fosters productive conversations, creativity and community. It is located on 32 acres of land and is ideal for hiking, biking and swimming. Wingspread offers superb dining and accommodations. 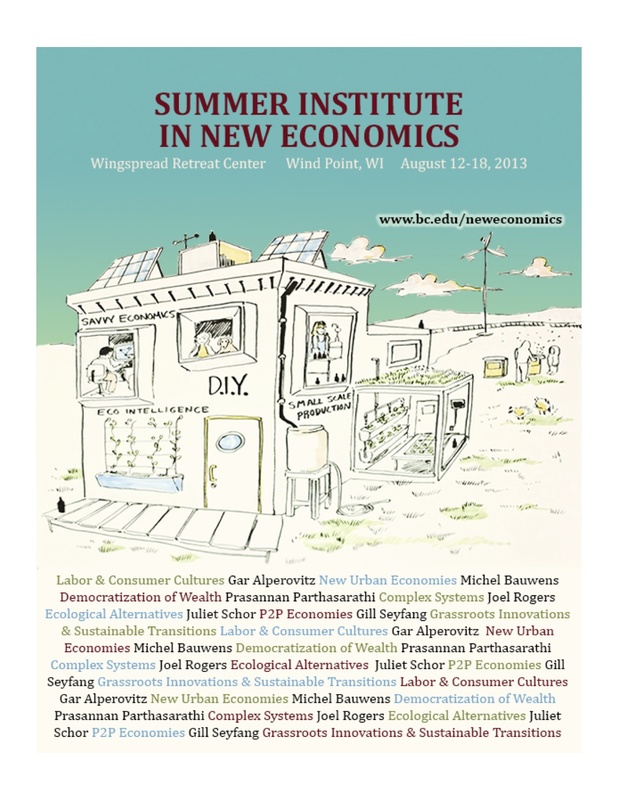 If you are interested in attending this year’s Institute, please be in touch with us at neweconomics@bc.edu. The cost of the Institute is $500 and scholarships are available for participants. Please see the website for more information on applications.